These pumpkin cinnamon rolls are rich and delicious, and they can be prepared in advance and frozen until you need them. That can be a big convenience for a holiday or special occasion when you have so many other things to do. The pumpkin dough is perfectly spiced and lightly sweetened while the buttery brown sugar filling gives them classic cinnamon roll flavor and texture. 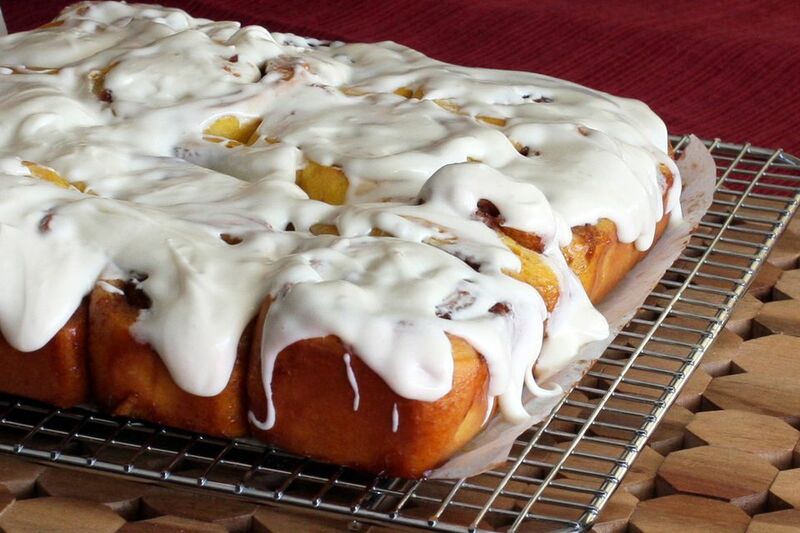 The cream cheese icing is the perfect finishing touch. And the bright color and flavor of the pumpkin make them the perfect holiday breakfast or snack. In a mixing bowl, bread machine, or bowl of an electric stand mixer, combine the milk and 3 tablespoons of melted butter. Add the pumpkin, 2 tablespoons of brown sugar, the cardamom or nutmeg, ginger, and salt. Add the egg, the flour, and the yeast. With the dough hook or by hand, mix to form a dough, or set the bread machine on the dough cycle. Knead for 6 to 8 minutes. Put the dough in the bowl, turning to grease all sides. Cover with plastic wrap and let rise in a warm place for about an hour, or until doubled in volume. On a floured board, roll the dough out into a rectangle about 10 inches x 15 to 16 inches. Spread 5 tablespoons of softened butter over the dough to within about 1/4 inch of one of the long edges (so it will seal when you roll it). Combine the 1/2 cup of brown sugar with the 1 tablespoon of cinnamon. Blend thoroughly. Spread the mixture over the butter layer. Dab a water-moistened finger along the bare long edge. Roll up tightly from the other long edge and seal, pinching the seam lightly. Place on a parchment paper-lined baking sheet and put in the freezer for about 30 minutes. This will firm the roll for easier slicing. Line a 9-inch square baking pan with parchment paper. Cut the roll into 1- to 1 1/2-inch slices. Arrange the slices in the prepared baking pan. At this point, you can cover with plastic wrap and let them rest for 30 minutes, or cover tightly and freeze for up to 1 month. If you are starting with frozen rolls, take them out of the freezer about 1 hour before baking. Bake them in the oven for 20 to 25 minutes, until browned and puffy. Remove and let them cool slightly while you prepare the icing. Combine the softened cream cheese with the powdered sugar, 2 teaspoons of softened butter, and a tablespoon of milk. Beat with an electric mixer, adding more milk or cream until the icing is a good consistency for spreading or drizzling. If the rolls are still quite warm, it will thin and run down the sides as you spread. If not that warm, you might want to drizzle.